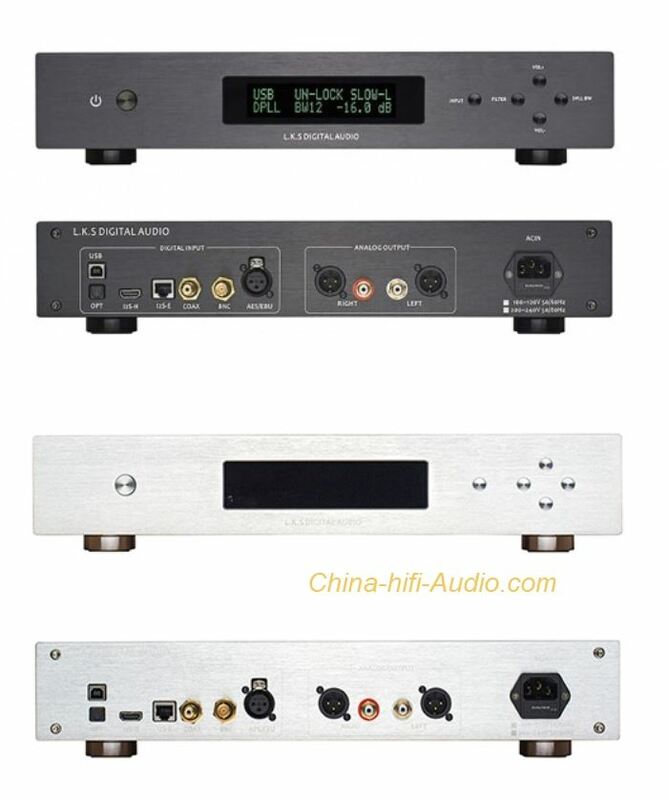 2.Two high-quality toroidal transformers, a total of 13 groups of linear power supply. 3.Built-in specially designed Italian Amanero USB module, original license license. USB module added to isolate the chip, you can isolate the computer to the audio system interference signal. 4.Supports USB, I2S / DSD single-ended signal (RJ45), I2S / DSD balanced signal (HDMI), oaxial, BNC, AES / EBU balance, Optical total seven-way source input, all ports support DSD input. 5.Analog audio output port includes standard RCA single-ended output and XLR balanced output pair. 6.Display with VFD display, the display exceptionally outstanding. 8.Support 0dB ~ -127dB digital volume adjustment, 0.5dB level. But also has a remote key to skip the volume adjustment function. 9.Support a variety of digital filter mode settings (see user manual). Can be arbitrarily selected, different filter mode, the digital filter attenuation characteristics are different. 10.Supports decoding of internal digital phase-locked loop bandwidth settings (see user's manual for details). 11.Support Deemphasis to increase or turn off. 12.The display has 4 levels of brightness adjustable. Adjusted by remote control. 14.Most of the settings with memory function, turn off the opportunity to automatically save the settings, restart the settings. 18.RCA unbalanced port output amplitude 2Vrms, XLR balanced port output amplitude 5Vrms. The internal use of the Italian Amanero USB module, the module uses a common active crystal oscillator, is not equipped with independent power supply, when connected to the decoder and computer through the USB cable, the USB module is powered from the computer's USB port.